The Trophy 2052 Walkaround wastes no time getting you to your finned nemesis. Our ride was very dry, which is surprising for a sportfisher. We find that they generally have wet rides, but the 2052 is an exception. When catching fish, do you envision yourself in some Hemingway-esque fight against the forces of nature? Armed with a rod and reel, you're in mortal combat against a beast from the depths. If you're that serious an angler, the new Trophy 2052 Walkaround was built for you — and it has everything you need to make those hyperbolic daydreams a reality. We tested the 2052 on the idyllic waters of Lake Coeur d'Alene, Idaho. It was a warm, beautiful day, but the water was ice-cold, thanks to runoff from the nearby mountains. The boat was tied along the docks at the Coeur d'Alene Resort, which has a (thankfully) small but effective no-wake zone. After just a few minutes, we were cruising on the lake's clear waters. The 2052 is 21 feet, 7 inches long without trailer and exactly 25 feet long with trailer. It has a beam of 8 feet, 1 inch, and a deadrise of 19 degrees. During our test, we had two adults on board and the fuel tank (85 gallons) was almost full. 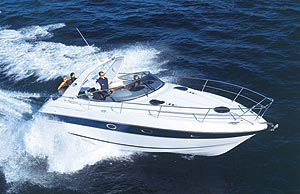 Our test boat was powered by a 1.7L MerCruiser Alpha 1 diesel stern drive (116 hp). Initially, the boat tracked a bit to the left, but an adjustment of the trim tabs seemed to help the situation. There was no discernible list, but we could definitely feel the 2052 lean into turns. Pushing the throttle forward, we went from 0 to plane in 8 seconds. 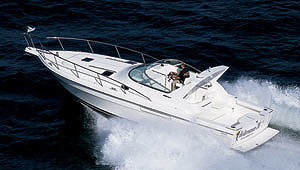 The boat hit plane at approximately 3,500 rpm, where it found a cruising speed of 24 mph. Trophy rates the cruising speed of the 2052 as 25 mph, so we were close. 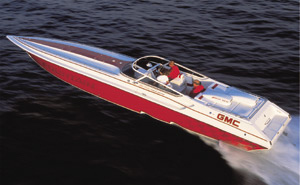 The boat's top speed is listed as 31.5 mph, but we were able to hit 32.3 mph during our test. At wide-open throttle, the tachometer topped out at 4,400 rpm. 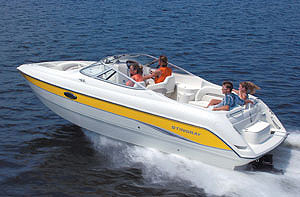 At cruising speed, the craft drinks only 4.4 gph — which means it gets an amazing 5.7 mpg. Even at top speed, the boat still gets 5.4 mpg. When it's time to get down to business, you'll find plenty of fishing features to satisfy your needs. For instance, the two 64 quart fishwells with drains will leave you plenty of room for your catch, so you can stay out on the water longer. The two fishwells are also easy to clean, so you won't have to fuss with them when you get back to the dock. The tournament-class baitwell has rounded corners and a vortex pump system that improves circulation and has adjustable aeration. The twin-jet circulation delivers clean water to both the top and bottom of the 64 quart tank, keeping your bait alive longer — and there's even an LED light to assist you when fishing at night. 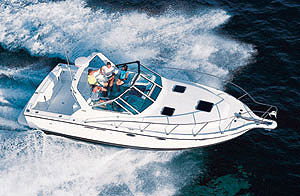 Four rod holders are located along the gunnels and the transom. Extra-high freeboard and coaming pads provide a comfortable and safe surface for fighting or landing big fish. About all you'll find below is a V-berth, which can be converted into a U-shaped dinette with pedestal table when the filler cushion is removed. A portable head is hidden underneath one of the settee's starboard cushions. The rest of the V-berth area hides stowage space for other necessities, such as tackle, PFDs and foul-weather gear. No sportfisher is complete without rod storage, so you'll find plenty of space for your "weapons of choice." The cabin door can be locked for security and privacy. The team at Trophy is proud of the 2052's superior construction. 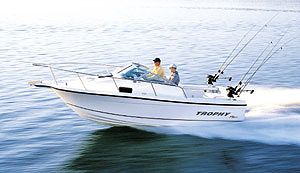 Function dictates form, so every detail has been designed to improve the boat's "fishability." The standard rod racks are lined with smooth PVC tubes that are unlikely to snag your rod guides or scratch their delicate graphite shafts. PVC tubes are also used to protect hoses and wiring. Chase wires are included, which will come in handy if/when you decide to add more electronics. All cleats and fasteners are stainless steel. Bow eyes and cleats are fastened through backing plates with stainless steel lock nuts and oversized washers, for increased durability. 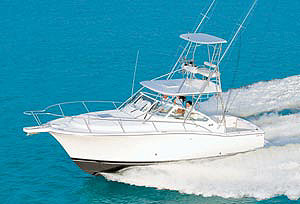 The bow rails are also stainless steel — and custom-fitted to each hull. There was no shuddering during our test. The boat felt solid the entire time. The Monolithic Stringer System provides much of that strength. Much like that of a heavy-duty truck frame, the system has extra-wide, deep shapes that are built in one unified piece, for greater durability and strength. The stringers and other components are built into the boat while it is still in the mold, to ensure the precise shape of the hull for optimal performance. The one word you may have noticed popping up repeatedly during this boat report is "durability." A rugged sportfisher has to be able to stand up to the rough weather and angry seas that often accompany the quest for the ultimate catch, and Team Trophy has made sure the 2052 Walkaround is up to the task. 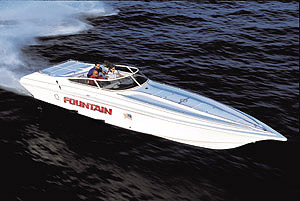 Aluminum non-glare dash panel, molded fiberglass footrest, 12v accessory outlet, stainless steel steering wheel, 1,000 gph manual and automatic bilge pump, mildew- and slip-resistant vinyl floor, port and starboard stowage lockers, Sunbrella Bimini soft top with boot, locking cabin with cushioned berth. Galvanized tandem-axle trailer with brakes; extended hardtop package with fiberglass hardtop, welded substructure, locking electronics locker and full isinglass enclosure; hardtop with aft isinglass cruise curtain with glass front and side panels, swim step with ladder, port sleeper seat, Sunbrella Bimini enclosure, Canadian Coast Guard certification.